I was born in West Germany, near Heidelberg, in a family of God-loving intellectuals and artists. In my very early childhood already I was deeply worried about the sense and meaning of life. I had many philosophical questions. Why we are living in this strange human body? What is the sense and reason for this life? Are this life and our fellow human beings only a dream or are they real? When I first got a book about the Indian culture at the age of five, I was deeply touched and delighted to read about the Indian festivals, like Deepawali and others, about the Indian mentality, customs, the nature, etc. I was so deeply touched, that I was very much longing to be there and I could identify myself already at that age with the Indian culture. But I never thought of getting the opportunity to go to India, so far away. In my childhood I was very introvert and my hobbies were singing, dancing and reading. I liked to read books about Saints who inspired me to live a life for God. I was in search for a divine personality who could tell me about the living reality of God, a person being established in constant God-experience. H.D. Paramahamsa Omkarananda Saraswati, a great Mystic and Sage, had created a beautiful Ashram in Switzerland. I was so much overwhelmed by Swami Omkarananda's Divinity, His utter Purity, His utter Selflessness, His profound and astounding, super-human Intelligence, His highly aesthetic and dignified way of talking and moving, His extreme Kindness, that my whole life changed. I had found a living personality, embodying the divine qualities for which I was searching in vain in philosophy books and my outer environment. Swami Omkarananda was living highest divine ideals. I found in Him the living and moving Godhead. He lived what He taught, that I could deeply feel and experience, to the core of my being. By my Guru Swami Omkarananda's grace, I got the opportunity to live in the Omkarananda Ashram Switzerland for some years and to study Sanskrit and Indian Philosophy. I also found nearby our Ashram some very nice Indian Classical Dance Teachers from whom I took daily private lessons in Bharatanatyam and Odissi Dance. I had the opportunity to perform Bharatanatyam at several places in Switzerland. 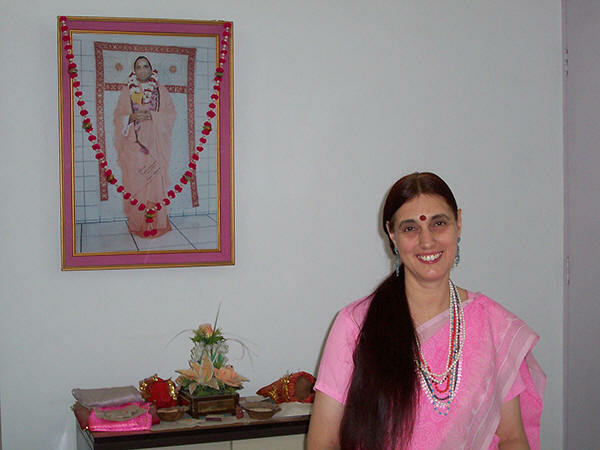 By the grace of my Guru Swami Omkarananda I was initiated through Vedic rituals into the Sanatana Dharma and got the name Kumari Somashekhari. Gurudev also has given me two titles: “Kalanidhi” (Ocean of arts) and “Guru-Bhakti-Ratna”, which I cherish very much. In the beautiful Omkarananda Ashram in Switzerland I could take part in Hawanas and Pujas, which are performed there all around the clock. I learned to recite many Mantras and Vedic hymns. Of course, I always liked to be a pure vegetarian and the strictly vegetarian food at our Ashram suits me very much. After a few years training in our Omkarananda Ashram Switzerland, my Gurudev Swami Omkarananda asked me whether I would like to intensify my studies in Indian Dance & Music and to go to India. I said “yes”. When I arrived in India, from the first moment I fell in love with this country and its people. I love the language Hindi, which I can speak now fluently. I like the grace, beauty and sweetness of the Indian mentality. I feel completely at home here, and in the meantime I got the Indian Citizenship. Now I am here in Omkarananda Ashram Himalayas, Uttarakhand, Rishikesh, for many years, but it seems to me like a short time. Here in India there is a deeply spiritual atmosphere which still can be felt, especially here in the Himalayas. Our Omkarananda Ashram Himalayas is running over 74 educational, spiritual and social Institutions in the Garhwal Himalayas, including beautiful Temples, etc. See the website of Omkarananda Ashram Himalayas. 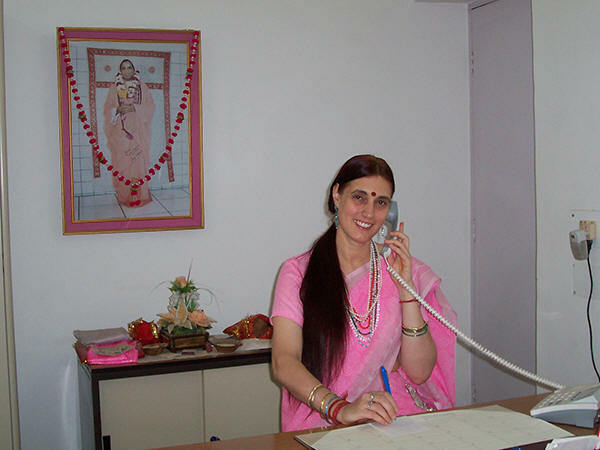 I am the Secretary of Swami Omkarananda Saraswati Charitable Trust. Thanks to the blessings of Gurudev I can look after Omkarananda-Kamakshi-Devi Mandir, which is a landmark in the entire State of Uttarakhand. As a Director of the Omkarananda Saraswati Natya Kala Academy I have trained hundreds of children of this area in the art of Indian Classical Dance. 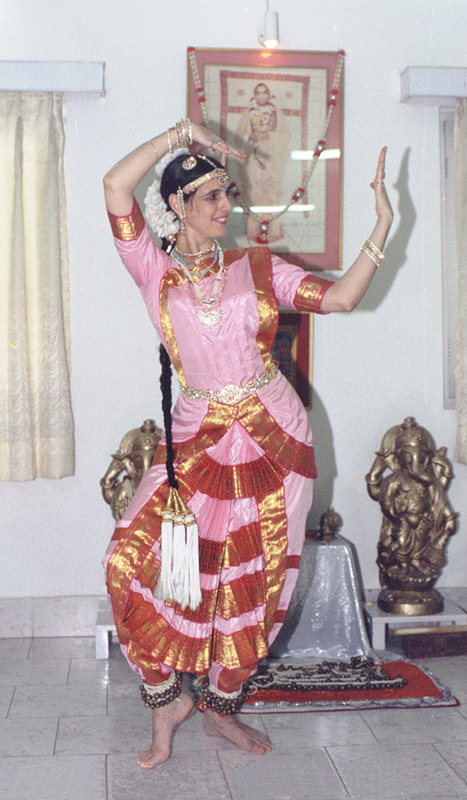 Though I have learned Odissi very intensively when I lived in our Omkarananda Ashram Switzerland, I have specialized presently in the North-Indian Temple-Style of Kathak Dance and in Bharatanatyam, the South-Indian Temple Dance. I love singing too, and I can sing Bhajans and devotional Songs in Sanskrit, Hindi, Garhwali, Brijbhasha and Tamil. I also can sing a heart-touching Telugu Song, describing the Sweetness of the Telugu language. I have got some training in South-Indian Karnatic Music, playing the Tambura and Veena. I have started to learn the South-Indian language Tamil - writing, reading, speaking - because I love the South-Indian Culture. In the same way, I would like to learn Telugu, too, if I get the opportunity. Indian Dance and Music mean so much to me. This art is fulfilling me completely. Here in the Omkarananda Ashram Himalayas I can live a spiritual life and it is my wish that in this life I can experience the Divine always, at all times, in all circumstances and serve mankind selflessly. I believe that through the grace of my adorable Sadgurudev Paramahamsa Omkarananda Saraswati, who has always guided and protected me, my wishes were fulfilled. 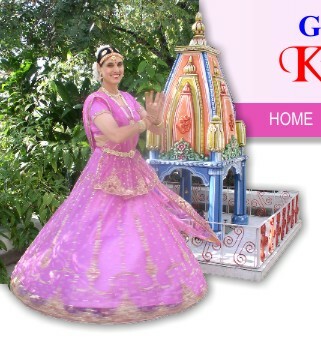 Indian Classical Dance and Music can be a powerful means for God-experience. This art is of divine origin and can inspire mankind. I have dedicated my whole life to learn this art, to practise this art and to teach this art and whenever possible propagate it through performances. I practise Indian Dances and Music here in my beautiful Omkarananda Ashram Himalayas. I am immensely grateful to Paramahamsa Omkarananda Saraswati that He has given me the opportunity to live in such a beautiful, heavenly place and learn the delighting inspiring and divine art of Indian Classical Dance and Music.